This article is about the town in India. For the oil field in Alaska, see Badami Oil Field. Badami, formerly known as Vatapi, is a town and headquarters of a taluk by the same name, in the Bagalkot district of Karnataka, India. It was the regal capital of the Badami Chalukyas from 540 to 757 AD. It is famous for its rock cut structural temples. It is located in a ravine at the foot of a rugged, red sandstone outcrop that surrounds Agastya lake. Badami has been selected as one of the heritage cities for HRIDAY - Heritage City Development and Augmentation Yojana scheme of Government of India. Badami is surrounded by many pre-historic places, Hiregudda, Sidlaphadi and Kutkankeri (Junjunpadi, Shigipadi and Anipadi), there we can see the rock shelters megalithic burial sites and paintings. The Puranic story says the wicked asura Vatapi was killed by sage Agastya (as per Agastya-Vatapi story), the area in which the incident happened so named as Vatapi. At Aihole there was a merchant guild known as Ayyavole Ainuravaru lived in the area have reformed. 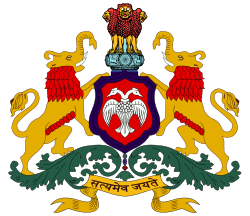 As per scholar Dr. D. P. Dikshit, the first Chalukya king was Jayasimha (a feudatory lord in the Kadamba dynasty), who in 500 AD established the Chalukya kingdom. His grandson Pulakeshin Ibuilt a fort at Vatapi. It was founded in 540 AD by Pulakeshin I (535-566 AD), an early ruler of the Chalukyas is generally regarded as the founder of the Early Chalukya line. An inscription record of this king engraved on a boulder in Badami records the fortification of the hill above "Vatapi" in 544. Pulakeshin's choice of this location for his capital was no doubt dedicated by strategic considerations since Badami is protected on three sides by rugged sandstone cliffs. His sons Kirtivarma I (567-598 AD) and his brother Mangalesha (598-610 AD) constructed the cave temples.Kirtivarma I strengthened Vatapi and had three sons Pulakeshin II, Vishnuvardhana and Buddhavarasa, who at his death were minors, thus making them ineligible to rule, so Kirtivarma I's brother Mangalesha took the throne and tried to establish rule, only to be killed by Pulakeshin II who ruled between 610 A.D to 642 A.D. Vatapi was the capital of the Early Chalukyas, who ruled much of Karnataka, Maharashtra ,Few parts of Tamil Nadu and Andhra Pradesh between the 6th and 8th centuries. The greatest among them was Pulakeshin II (610-642 AD) who defeated many kings including the Pallavas of Kanchipuram. The Pallavas under the king Narasimhavarma I seized it in 642 AD & destroyed the vatapi. Pulakeshin II's son Vikramaditya I of Chalukyas drove back Pallavas in 654 AD and led a successful attack on Kanchipuram, the capital of Pallavas. Then Rashtrakutas came to power in Karnataka including Badami around 757 AD and the town lost its importance. 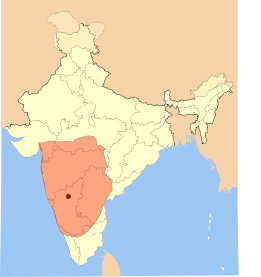 Later it was ruled by the Hoysalas. Badami has eighteen inscriptions, among them some inscriptions are important. The first Sanskrit inscription in old Kannada script, on a hillock dates back to 543 CE, from the period of Pulakeshin I (Vallabheswara), the second is the 578 CE cave inscription of Mangalesha in Kannada language and script and the third is the Kappe Arabhatta records, the earliest available Kannada poetry in tripadi (three line) metre. one inscription near the Bhuthanatha temple also has inscriptions dating back to the 12th century in Jain rock-cut temple dedicated to the Tirtankara Adinatha. In the Carnatic music and Hamsadhwani raga the Vatapi Ganapatim Bhaje by the composer Muthuswami Dikshitar. The idol of Vatapi Ganapati brought from Badami by Pallavas, is now in the Uthrapathiswaraswamy Temple, near Thanjavur of Tamil Nadu. In 7th century, Vatapi Ganapati idol was brought from Badami (Vatapi - Chalukya capital) by Pallava who defeated Chalukyas. A Buddhist cave in a natural setting that can be entered only by crawling on knees. The Bhootnath temple, a small shrine, facing the lake, constructed in 5th century. Badami Fort situated on top of the hill. Many Shivalayas including the Malegatti Shivalaya with 7th century origins. The Mallikarjuna temple dating back to the 11th century, built on a star shaped plan. a Dargah, a dome of an Islamic place of worship on the south fort side. Vista points on top of the North Fort for the view of the ancient town below. Temple of Banashankari, a Kuladevata (family deity) for many families, is located near Badami. Archaeological museum, that has collection of sculptures from Badami, Aihole and Pattadakal. Badami is famous for its sandstone cave temples. 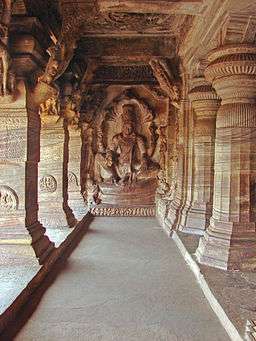 Cave temple 1 may be the oldest in Badami. 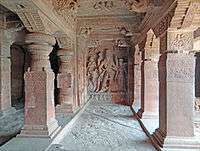 It is made of red sandstone and has a hall with numerous pillars and a square shaped sanctum hollowed in the control back wall. There are paintings of amorous couples on the ceiling. Other features include Shiva and his wife Parvathi with a coiled serpent and the 18 armed lord Nataraja in 81 dancing poses. Cave temple 2 is dedicated to Vishnu (as Trivikrama) with one foot mastering the Earth and the other the sky. Vishnu is also portrayed as Varaha and Krishna. Cave temple 3 dates back to 578 AD. The façade of the cave is nearly 70 feet wide, with carvings of ganas on the plinth. It contains examples of Deccan art, illustrating the culture and clothing of the 6th century. There are high relief carvings of Vishnu with a serpent, Vishnu as Narasimha, Varaha, Harihara and Trivikrama. Cave temple 4 relates to 6th century Jainism. There is a carving of the Tirthankara Parshavnatha (with a serpent at his feet). Mahavira is depicted in a sitting posture. Tourism Badami Cave-I the first shrine has at its entrance Shiva’s door keepers; to the right inside is the figure of Shiva of about five feet height and in the tandava dancing pose with 18 arms. Beside him are Nandi, dancing Ganapati, etc. There is a neatly carved perfect figure of Mahishasuramardini and several other rock –cut dwarf images of kubja ganas, Nagaraja or snake king, Vidhyadhara couple, etc., are on the ceiling. Badami-Cave-2 the second cave and on its front are the guards or dwarapalakas holding lotus in their hands. East and West walls of the cave have large images of Bhuvaraha and Trivikrama. On the ceiling are engraved Ananthashayana, Bramha, Vishnu, Shiva and Asthadikpalakas. Badami-Cave-3 the third cave is dedicated to Vishnu, and is the best and the biggest, and it has splendid giant figures of Paravasudeva, Bhuvaraha, Harihara and Narasimha. All these statues are engraved in a vigorous style. An inscription found here records the creation of the shrine by Mangalesha in 578. There are some paintings on the ceiling and the style indicates maturity but has lost its original dazzling colour. The bracket figures on the piers here are some of the finest. Badami-Cave-4, the fourth cave is Jaina which lies a little east of cave III. The sanctum is adorned by the image of Mahavira. The pedestal contains an old Kannada inscription of the 8th century A.D. which registers the death of one Jakkave. Scores of Jaina Thirthankara images have been engraved in the inner pillars and walls. In addition to it, there are some idols of Bahubali, Yakshas and Yakshis. Some scholars assign the cave to the 8th century. 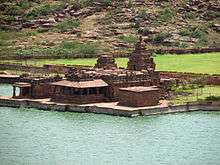 On the north hill, there are three temples, of which Malegitti-Shivalaya is perhaps the oldest temple and also the finest in Badami, and has a Dravidian tower. Out of the two inscriptions found here, one states that Aryaminchi upadhyaya, as the sculptor who got this temple constructed and the other dated 1543 speaks of the erection of a bastion during the Vijayanagara rule. The lower Shivalaya has a Dravidian tower, and only the sanctum remains now. Badami fort lies west of the Bhuthnatha temple, atop a cliff right opposite the Badami cave temples. The entrance to this temple is right through the Badami museum. It is a steep climb with many view points and dotted with little shrines. The path is laid with neatly cut stone, the same that adores all the architecture around. It is also believed that name Badami has come from colour of its stone(badam -Almond). Badami is located at 15°55′N 75°41′E﻿ / ﻿15.92°N 75.68°E﻿ / 15.92; 75.68. It has an average elevation of 586 metres (1922 ft). It is located at the mouth of a ravine between two rocky hills and surrounds Agastya tirtha water reservoir on the three other sides. The total area of the town is 10.3 square kilometers. It is located 30 kilometers from Bagalkot,128 kilometers from Bijapur, 132 kilometers from Hubli, 46 kilometers from Aihole, another ancient town, and 589 kilometers from Bangalore, the state capital. The temperature ranges from minimum 23 degrees to 45 degrees during summer and from 15 to 29 degrees in winter. The rainfall of the area is 50 centimeters. Best time to visit is between low humid season from November and March. The climate has made it a safe haven for the monkeys of south India. Tourists often flock to Badami for the opportunity to see monkeys interact in a natural environment. The main economy is centered around karnataka tourism. It is a town in the Bagalkot District in Karnataka state, India. It is also headquarters of Badami Taluk in the district. 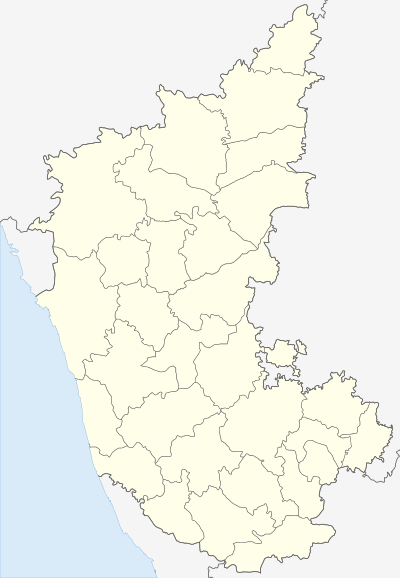 The nearest airport is Belgaum about 150 kilometers away. It is on the Hubli - Sholapur rail route, and the rail station is 5 kilometers from the town. It is also connected by road to Hubli and Bijapur. Badami is reachable from Bengalooru by a 12-hour bus ride, or by a direct train "Solapur Gol Gumbaz Exp (train no. 16535)" or with a combination of an overnight train journey from Bangalore to Hospet followed by a short bus ride from Hospet to Badami. Another train journey could be from Bangalore to Hubli (8–9 hours) and then a bus ride to Badami (3 hours). Badami is around 130 km from Hubli. Local transport is by Rickshaws, tongas and city buses. Badami is around 135 km from Hospet via NH367 and NH13. A car journey would take around 2 hours and 30 minutes from Hospet to Badami. Go to http://www.badamionline.com/ for information on reaching badami by Road, by Train and by Air. As of 2001 India census, Badami had a population of 25,851. Males constitute 51% of the population and females 49%. Badami has an average literacy rate of 65%, higher than the national average of 59.5%; with 59% of the males and 41% of females literate. 14% of the population is under 6 years of age. Panoramic view of Agastya lake, Badami. Badami's red sand stone cliffs are popular amongst local and international climbers. This is great location for free sport climbing and bouldering. The cliffs have horizontal crack systems, similar to Gunks. There are over 150 bolted routes and multiple routes for free climbing. Gerhard Schaar, a German Climber and Pranesh Manchaiah, a local climber from Bangalore, were instrumental in setting up the sport routes driving a project called 'Bolts for Bangalore'. ↑ "Rich slice of history - Badami". The Hindu. Chennai, India. 17 May 2013. Retrieved 2013-05-24. ↑ Azmathulla Shariff. "Badami Chalukyans' magical transformation". Deccan Herald, Spectrum, July 26, 2005. Archived from the original on 7 October 2006. Retrieved 2006-11-10. ↑ Kalpana sunder (2010-03-07). "Rocky tryst with history". The Hindu. Chennai, India. Retrieved 2010-03-28. ↑ "Vatapi Ganapati". Retrieved 2010-03-28. ↑ "Badami Cave Temple". Retrieved 2009-03-02. ↑ "Reports of National Panchayat Directory: Village Panchayat Names of Badami, Bagalkot, Karnataka". Registrar General & Census Commissioner, India. Archived from the original on 13 November 2011. ↑ "Falling Rain Genomics, Inc - Badami". Fallingrain.com. Retrieved 2013-02-12. ↑ "Gerhard Schaar Official". gerhardschaar.com. Retrieved 2015-10-15. ↑ "Bolts for Bangalore". Climbing.com. Retrieved 2012-01-15. ↑ Prabhu, Nagesh (26 December 2012). "Favourite destination for the film industry". Chennai, India: The Hindu. Retrieved 2013-01-10. Wikimedia Commons has media related to Badami. 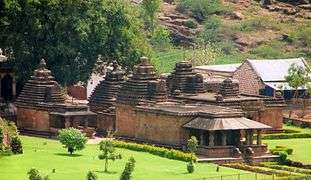 Wikivoyage has a travel guide for Badami.